My husband and I had a plan. It was ambitious. Some might even call it crazy. That plan? To take everyone at our barn horse camping this summer. The planning for this trip started back in April. 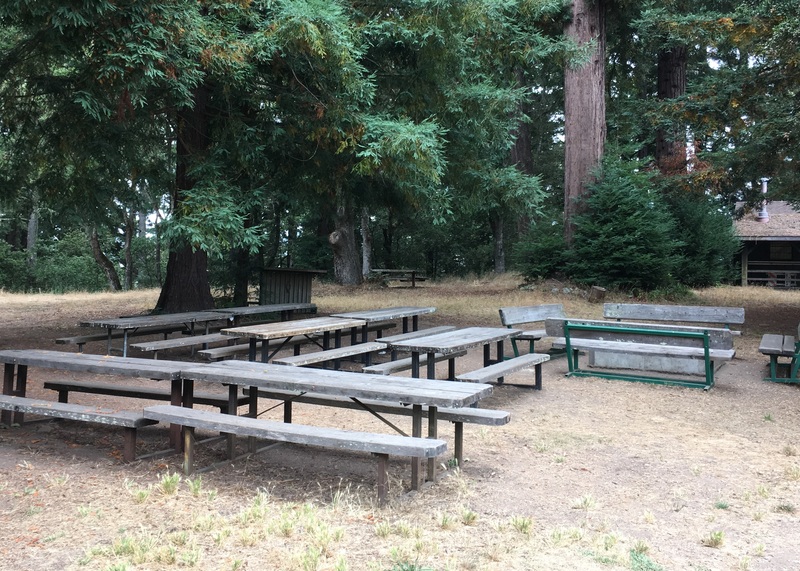 The campground we wanted to use is so popular it books months in advance and it’s so hard to round people up during the summer, we wanted to get this on everyone’s calendar before summer vacations or other plans were made. With everyone on board, the more difficult part started: planning. We needed to figure out how to get 9 horses to the park with only 2 horse trailers. We also had to organize feed, tack, sleeping arrangements for everyone, a potluck for dinner, care for the 2 horses left behind, and what felt like a million other minor details. 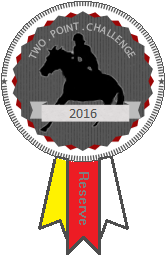 It took multiple spreadsheets and a lot of emails and conversations, but we made it happen. My husband and I took Shasta, Nilla, and Eugene up to the campground on Friday night. We booked the smaller and cheaper site for that night as it was just us. This campground is really hard to get to. The road is narrow, steep, and winding and it goes on forever. And then you get to the park and have to go down a narrower, windier, and steeper dirt road that’s on a timer because it’s too narrow for vehicles to go both directions at the same time and there are no pull-outs. With the farrier and clinic, we didn’t end up getting to the horse campground until 6:30. 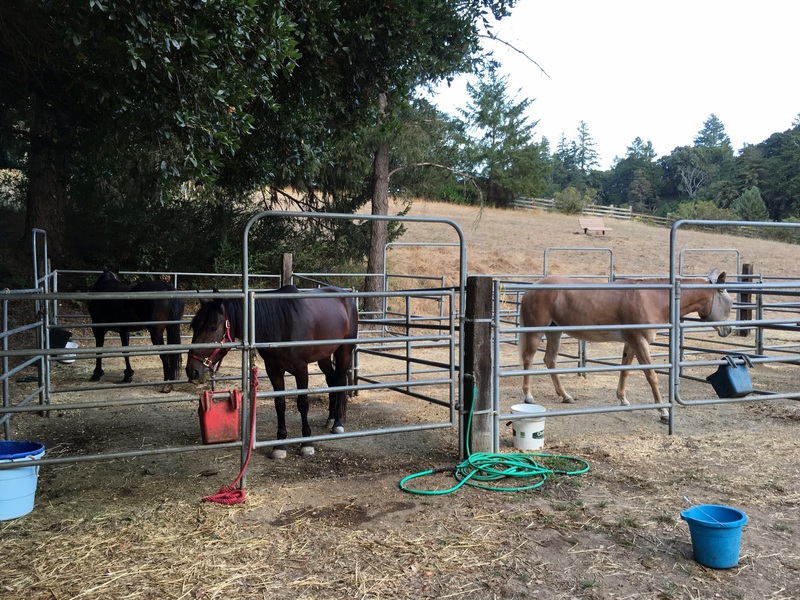 We hurried to put the horses in their corrals and then make our own dinner before it got dark. The campsite is amazing though. There are tons of corrals available on a first-come, first serve basis. There are two 10 person sites and 1 large group site for 30. This campground has a bathroom with real toilets and (gasp) hot showers. There’s even a shared sink, fridge, and microwave. I have never stayed at such a nice campground; it’s positively luxurious. Saturday, we enjoyed breakfast before my husband drove back to our barn to pick up three more horses. I stayed at the campground with our three and started moving our stuff over to the large group site we had booked for Saturday night. The horses and people trickled in over the next few hours and once we were all there, we went out on a group ride. We planned to do a short loop that a ranger said was 6 miles and “easy.” It ended up being 7.5 miles and not very easy. The beginning was a lot of narrow switch-backs going downhill and some of the horses were going a bit insane about the group ride. 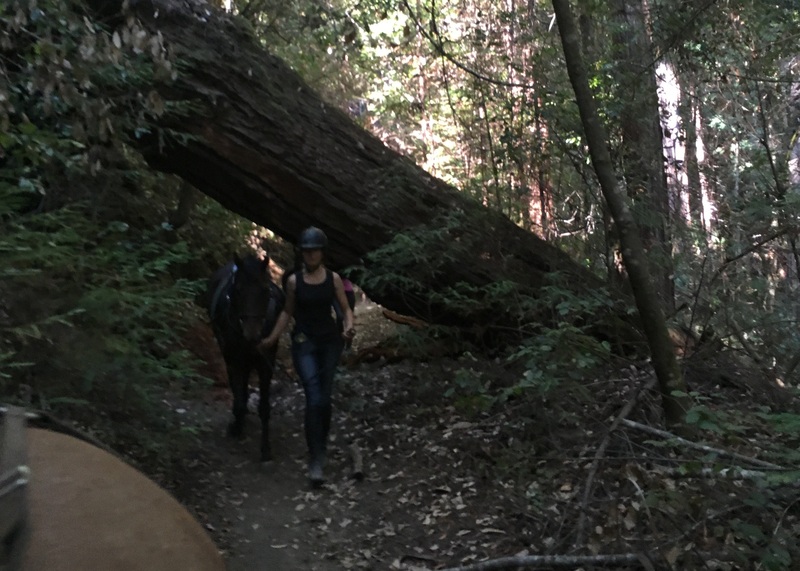 We also ad to dismount and go under a crashed redwood. We eventually ended up on a nice, wide fire road with views of the distant ocean. It’s actually possible to ride to the ocean from this park, but that’s a long ride. Because of all the antics and the length of the trail, we were gone for longer than planned, but when we got back all the family members and friends had finished setting up the campground and started dinner. Despite having a potluck plan/sign up, everyone brought tons of food and we probably had enough food for 3 times the number of people we had. Our barn owner even brought veggies from her garden fertilized – as she was happy to tell us – by our own horses’ poop. Yumm. My friend J, who is now part owner of Dijon, was celebrating her birthday and her friends had come up. Her birthday gift was a T-rex suit. I asked if she was going to ride Dijon in it and she said, no she didn’t want to die. I was a little drunk on Margaritas at this point so I decided to put her costume on and see if I could get any of our horses to not freak out about it. Spoiler alert: it was terrifying. Nilla was actually really cute. If I spoke, she would look over and prick her ears at me. but she was not willing to come anywhere near me. Even when I had hay and carrots. You can see Eugene and Shasta huddling as far away from me as possible, so Nilla was definitely handling it the best, but she was still not happy about it. 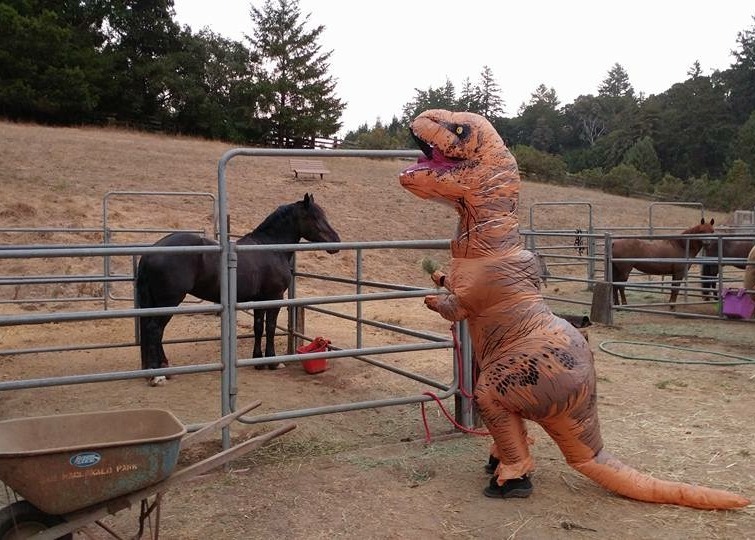 Once I gave up on getting any of the horses to befriend the T-rex, we returned to the campground. A few people had brought guitars and were providing live entertainment. There were also requisite s’mores and we had birthday cake on top of that. Then we even had some sign-alongs around the camp fire. It was an amazing evening. To me, this is the sort of thing that happens in movies, not real life. To spend the evening surrounded by friends enjoying the great outdoors, was worth all the planning and driving. Eventually we all had to clean up and head to bed. I’ll cover Sunday in my next post. Jealous!!!! What a wonderful night. The whole weekend was great, but there’s something about a camp fire. It was an awesome weekend. I generally enjoy going with just my husband. half the fun of camping is getting away from everyone. But this was a great weekend. lol at the trex costume. Hilarious. I was laughing the whole time. Serious T-Rex envy over here. So awesome! And I have no idea how anyone actually ever got ON a horse wearing one of those T-rex costumes. Crazy. I didn’t realize just how difficult it was to get into and then move in one of those costumes. I could barely handle walking. This sounds like soooo much fun. I would love to do something like this with barn friends! 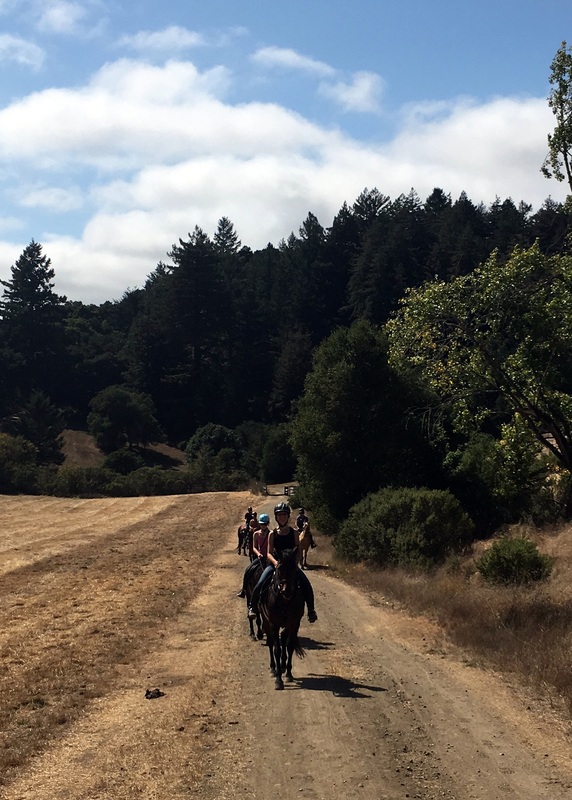 The actual trail riding was much more painful as a group. No one is used to groups and all the horses were freaking the f out. This sounds like SO MUCH FUN! I love reading about your camping adventures. Also… That T-Rex costume is the best ever! The T-rex costume was so much fun. OMG I’m dying over the T-Rex suit. 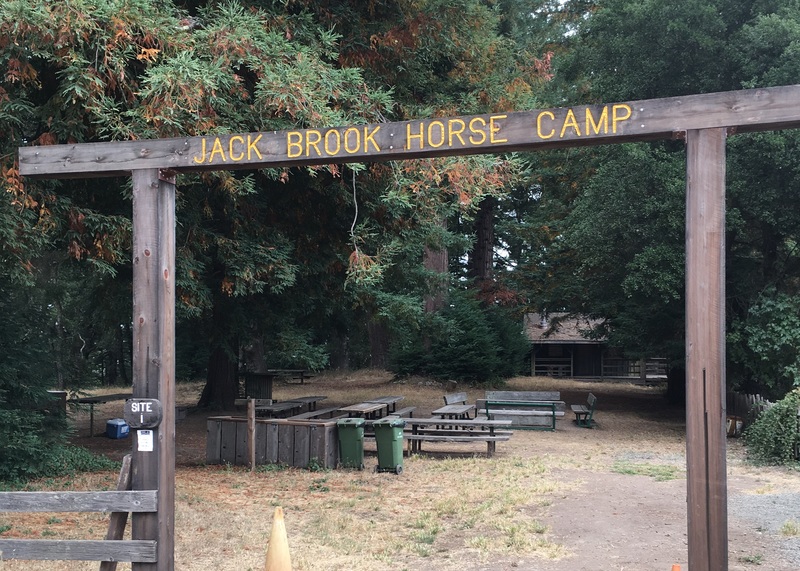 Which campground was it? Looks pretty although I’d prob have an aneurysm over the drive in. The drive out was worse. Wait for tomorrow’s post on that. 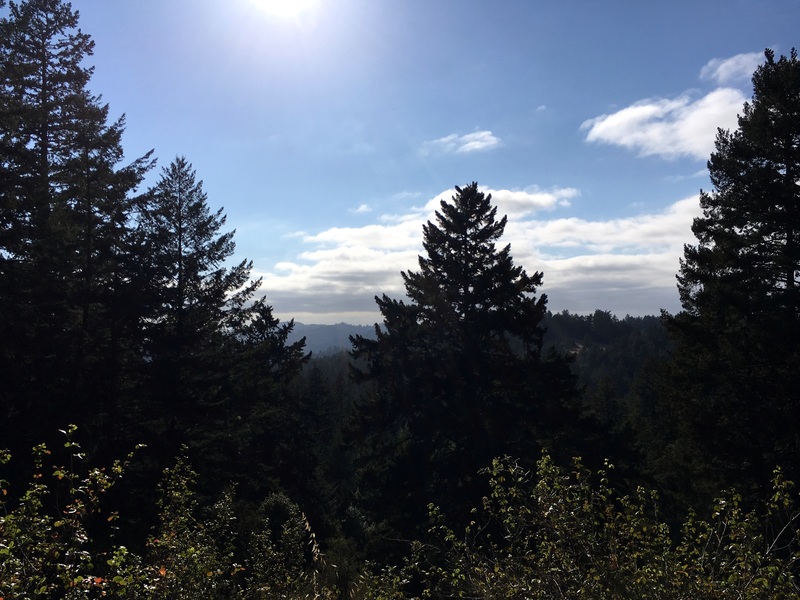 It’s Sam McDonald County Park. 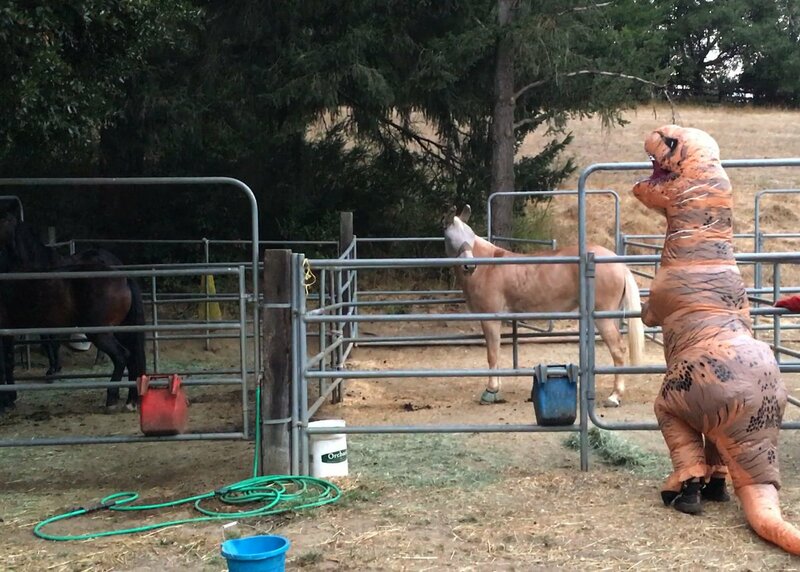 OMG, I’m laughing my head off at the Margarita + TRex costume = horse torture. I love Nilla’s face- ‘WTF are you doing NOW? NO, I’m not coming and reinforcing this sort of silliness…. The humans thought it was hilarious. The horses were less enthused.